, first geographer to the king of France, member of the academy of inscriptions and belles lettres, and of the society of antiquaries, London, and joint-geographer of the academy of sciences, was born at Paris on the 11th of July, 1697. His father’s name was Hubert Bourignon, and his mother’s Charlotte Vaugon. 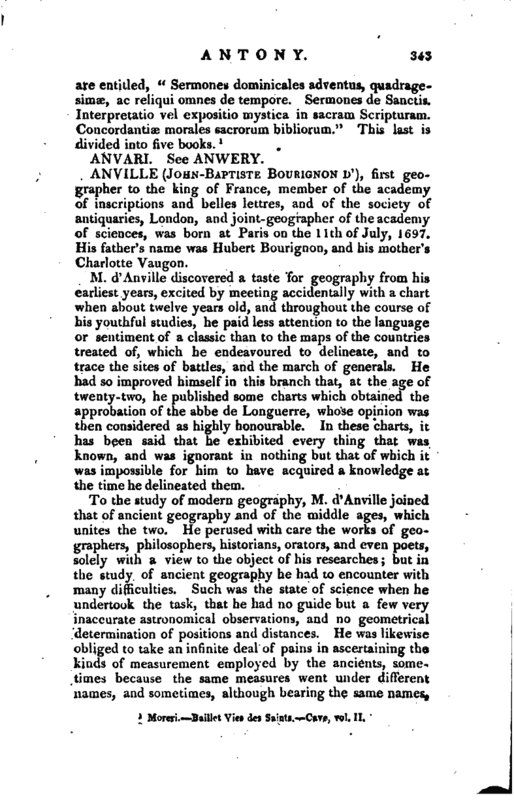 M. d’Anville discovered a taste for geography from his earliest years, excited by meeting accidentally with a chart when about twelve years old, and throughout the course of his youthful studies, he paid less attention to the language or sentiment of a classic than to the maps of the countries treated of, which he endeavoured to delineate, and to trace the sites of battles, and the march of generals. He had so improved himself in this branch that, at the age of twenty-two, he published some charts which obtained the approbation of the abbe de Longuerre, whose opinion was then considered as highly honourable. In these charts, it has been said that he exhibited every thing that was known, and was ignorant in nothing but that of which it was impossible for him to have acquired a knowledge at the time he delineated them. To the study of modern geography, M. d’Anville joined that of ancient geography and of the middle ages, which unites the two. He perused with care the works of geographers, philosophers, historians, orators, and even poets, solely with a view to the object of his researches; but in the study of ancient geography he had to encounter with many difficulties. Such was the state of science when he undertook the task, that he had no guide but a few very inaccurate astronomical observations, and no geometrical determination of positions and distances. 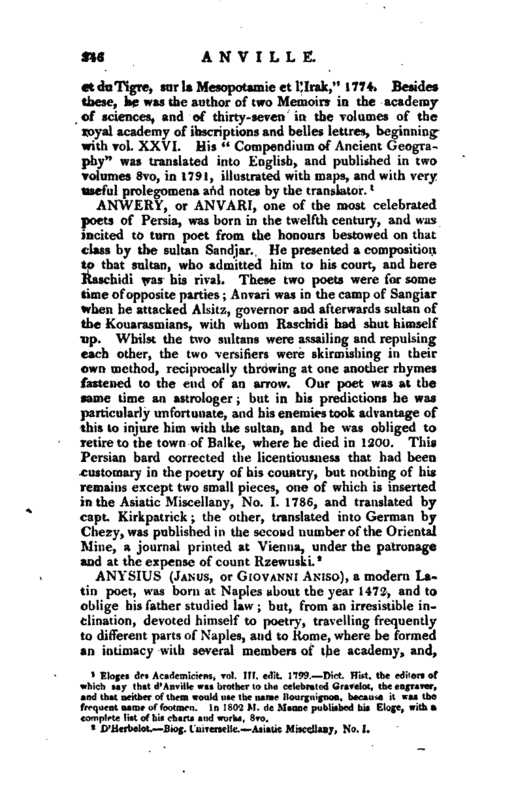 He was likewise obliged to take an infinite deal of pains in ascertaining the kinds of measurement employed by the ancients, sometimes because the same measures went under different names, and sometimes, although bearing the same names, | because they differed according to the country or age in which they were adopted. In a word, this study was so much in its infancy when M. d’Anville began his researches, that he had innumerable difficulties to surmount, of which they who have profited by his labours aud by the advanced state of knowledge, can have no idea. In the pursuit of all his studies he had every advantage of nature and disposition, a strong memory, an indefatigable ardour, and a depth of judgment which enabled him to compare, select, and decide upon the most accurate principles. While thus employed, he was elected a member of the academy of belles lettres, whose volumes he enriched with many valuable papers. The accuracy of M. d’Anville’s maps will, perhaps, appear the more extraordinary when it is considered that he had never travelled, and knew very little either of geometry or astronomy. 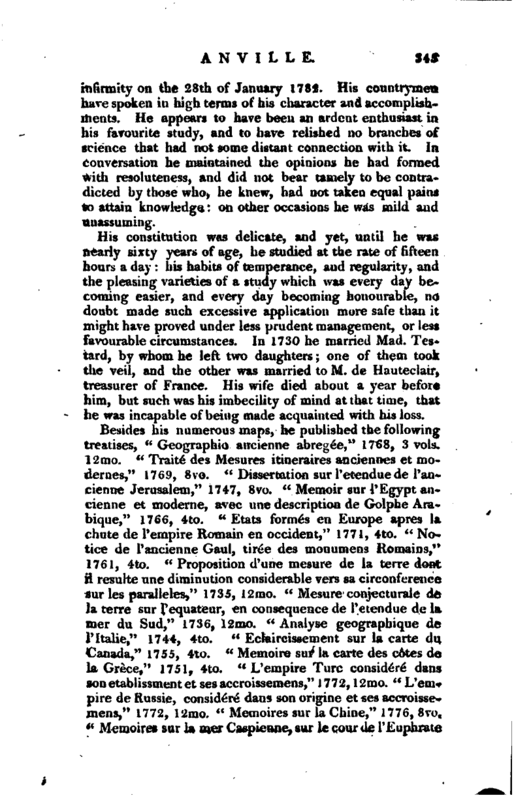 When the question of the oblate figure of the earth was debated among the astronomers, he endeavoured to resolve it from the geographical knowledge he had acquired, and published a work entitled “Mesure conjecturale de la terre sous l’equateur,” and his result was contrary to that which had been founded on astronomical observations. In 1773, the academy of sciences appointed him joint-­geographer, and although he was now enfeebled by age, he wished to testify his respect for the honour, by presenting the society with some memoirs. In the first and most important of these, he corrected an egregious error which had appeared in every map, respecting the situation of Mesopotamia, and this he had been enabled to do by examining the astronomical observations of the Arabians. 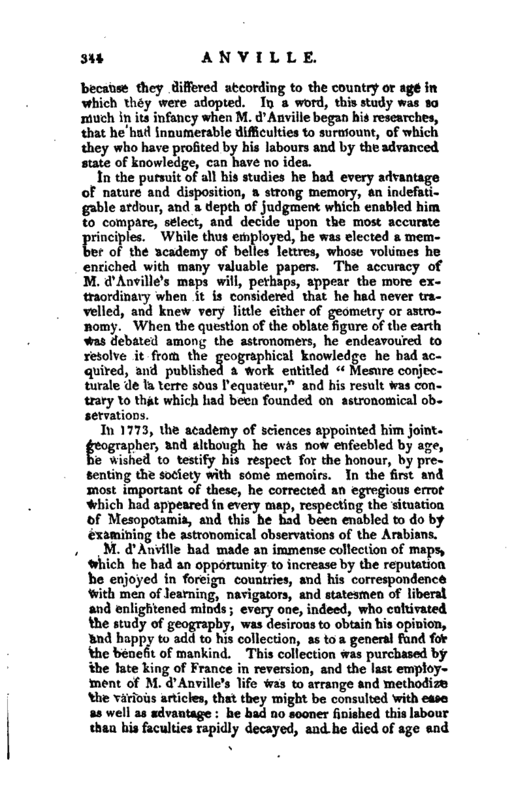 M. d‘Anville had made an immense collection of maps, which he had an opportunity to increase by the reputation he enjoyed in foreign countries, and his correspondence with men of learning, navigators, and statesmen of liberal and enlightened minds; every one, indeed, who cultivated the study of geography, was desirous to obtain his opinion, and happy to add to his collection, as to a general fund for the benefit of mankind. This collection was purchased by the late king of France in reversion, and the last employment of M. d’Anville’s life was to arrange and methodize the various articles, that they might be consulted with ease as well as advantage: he had no sooner finished this labour than his faculties rapidly decayed, and he died of age and | infirmity on the 28th of January 1782. His countrymen have spoken in high terms of his character and accomplishments. He appears to have been an ardent enthusiast in his favourite study, and to have relished no branches of science that had not some distant connection with it. In conversation he maintained the opinions he had formed with resoluteness, and did not bear tamely to be contradicted by those who, he knew, had not taken equal pains to attain knowledge: on other occasions he was mild and unassuming. His constitution was delicate, and yet, until he was nearly sixty years of age, he studied at the rate of fifteen hours a day: his habits of temperance, and regularity, and the pleasing varieties of a study which was every day becoming easier, and every day becoming honourable, no doubt made such excessive application more safe than it might have proved under less prudent management, or less favourable circumstances. In 1730 he married Mad. Testard, by whom he left two daughters; one of them took the veil, and the other was married to M. de Hauteclair, treasurer of France. His wife died about a year before him, but such was his imbecility of mind at that time, that he was incapable of being made acquainted with his loss.